Jimmy V’s Osteria + Bar recently celebrated their grand opening with a reception on Tues., Sept. 24. This Downtown Raleigh restaurant is located at 420 Fayetteville St., in the Sheraton Raleigh Hotel. The restaurant is named for Jim Valvano, the late North Carolina State University basketball coach. 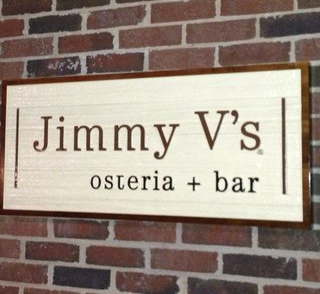 Jimmy V’s Osteria + Bar supports the community and is unique by donating 2.5 percent of its revenue to fund research through The V Foundation for Cancer Research. The atmosphere at Jimmy V&apos;s Osteria + Bar is inviting. The high ceilings and brick archways give the restaurant an open feel. There is also a large bar and open kitchen with a cozy dining room inside. My favorite part about the atmosphere at Jimmy V&apos;s Osteria + Bar is definitely the outdoor dining. The large patio with posh seating is perfect for the fall weather. Before ordering dinner, grab one of Jimmy V&apos;s Osteria + Bar&apos;s original cocktails. With cocktails like the Cucumber Mint Mojito, Basil Smash and Old Fashion, there&apos;s something for everyone to enjoy. Enjoy an appetizer while you sip on your drinks. The charcuterie board changes often and is a must when you&apos;re debating on what appetizer to order. If you want something heavier for an appetizer, try the risotto balls with marinara sauce. 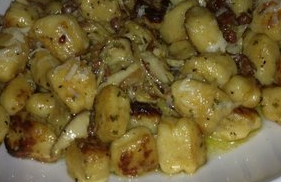 Jimmy V&apos;s Osteria + Bar has a menu to satisfy all foodies. The menu includes a variety of pizzas. 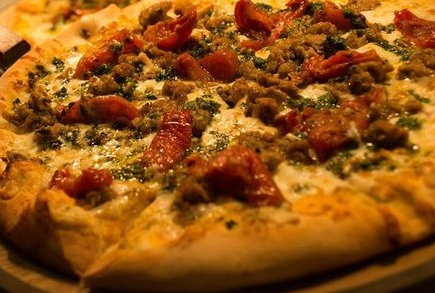 If you&apos;re a meat lover, definitely try Rocco&apos;s Pie. The pizza includes red sauce and cheese with sausage, tomato, and pesto. The Tuscan pizza is another great option with grilled chicken, prosciutto, artichoke hearts, kalamata olives, arugula, basil, a five cheese blend and diced tomatoes. The menu also contains a variety of Italian-American dishes. The lobster macaroni and cheese comes highly recommended to me from a friend who recently dined at Jimmy V&apos;s Osteria + Bar. The seafood risotto is another great option with large scallops and juicy shrimp on top, and the gnocchi is the perfect vegetarian option. You can&apos;t leave Jimmy V&apos;s Osteria + Bar without ordering dessert. There are so many great options to choose from like the s&apos;mores dessert or tiramisu. Indulge after dinner and satisfy your sweet tooth. You&apos;ll feel good about dining out during your visit to Jimmy V&apos;s Osteria + Bar to support a great cause.